Exploring Goa, one sunset at a time! Goa always amazes me with its treasure trove of sight seeing places - a new one popping up every now and then just when I think I have seen enough of Goa. There are so many gems waiting to be explored but the time restriction that often binds tourists allows one to visit only a certain number of popular places. 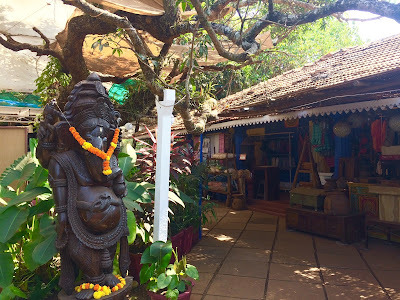 So I set about compiling a small list of popular places in Goa, which will take you on a ride through time, tell you tales of myth and magic, as well as let you unwind and enjoy the beautiful gifts of nature. 1. Fort Aguada: This 17th century Portuguese fort is a must see for history buffs as well as nature enthusiasts. Take leisurely strolls around the huge laterite structure and treat yourself to splendid views of the Arabian sea beneath. The lighthouse here is supposed to be one of the oldest in Asia. This place is open everyday from 9.00 am to 6.00 pm. 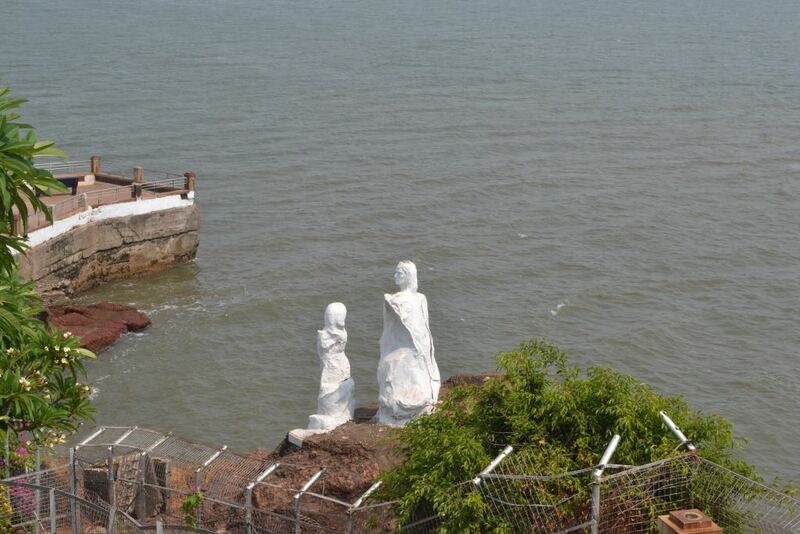 The Sinquerim fort, a remnant of Aguada fort lies 3.5 Km from here and is another beautiful view point. The nearest beaches here are the Sinquerim beach and the Candolim beach, hence food and stay is not hard to find nearby. Fort Aguada is 17 Km from Panjim and 41 Km from the airport. 2. Basilica of Bom Jesus: This famous church of Old Goa never fails to impress anyone who looks at it for the first time. The majestic laterite structure with its baroque style architecture is a world heritage monument as well as an iconic symbol of Goa and it holds the holy relics of St.Francis Xavier. The basilica also houses a modern art gallery containing several paintings depicting scenes from the holy bible. The church is open to Public from 9.00 to 6.30 pm on all weekdays and 10.30 am to 6.30 pm on sundays. The church is around 13 Km from Panjim and 26 Km from the Dabolim airport. 3. Se Cathedral: Located in Old Goa, near the Bom Jesus Basilica is the Se Cathedral, an imposing monument to the victory of Afonso Albuquerqe over the muslim army. This church, supposedly the largest in Asia is an awe-inspiring structure and, another of those most photographed places in Goa. No wonder then that its construction took almost a hundred years to be completed! The church stays open from 7.30 am to 6.00 pm everyday. 4. Candolim Beach: One of the popular beaches in north Goa, Candolim is always a pop of color with its bright umbrellas and beach-beds. Water sports of all kinds are available here and the place is teeming with shacks and little shops selling beach clothes and accessories. The crowd here is a delightful mix of domestic and foreign tourists and the place can get a bit crowded sometimes. During the off season, though the beach is open, it remains isolated as all the shacks and water sports activities cease their operations. Candolim beach is 13 Km from Panjim and 37 Km from the Dabolim airport. 5. Dona Paula: This one is another must-see place in Panjim to catch a beautiful sunset while you are surrounded by vistas of the sea on all sides. Stroll along the jetty leisurely or indulge in water-sport activities from the beach here. And yeah, this place abounds with fantastic tales surrounding its name, which add to the allure of the place. About 28 Km from Dabolim airport and 5.5 Km from Panjim, you can get a cab or even an auto-rickshaw or the KTC buses if visiting from Panjim. 6. Shantha Durga Temple: Located at Kavalem village near Ponda, this 450 year old beautiful temple dedicated to Goddess Shri Shantadurga is definitely worth a visit. This temple had been built by Charapathi Sahu, grandson of Shatrapathi Shivaji, after the deity was shifted here from its earlier location during the portuguese rule. Goddess Parvathi is said to have taken the form of Shantha Durga, to stop a fierce fight between lord Vishnu and Lord Shiva. Though there are lot of stalls and vendors selling food and refreshments around the temple, the nearest place for decent accomodation and food would be Ponda city. The temple is located at a distance of 33 km from Panjim and around 30 km from the airport. The temple is open on all days from morning till night. Shri Shantha Durga Temple, Ponda. 7. Chapora Fort: A favorite with tourists especially the young crowd, Chapora fort offers perhaps the best views of the sunsets over the Arabian sea as well as the panorama that comprises the Chapora river and the surrounding backwaters and greenery; and as an added bonus, these beautiful ruins offer a master class in history too. However, this fort had its claim to fame with the bollywood cult hit "Dil Chahtha Hai"! Though it is open all day long, evenings are the best time to visit. A small climb up the hill is mandatory to reach the fort but is well worth the effort. Chapora fort is about 1.5 km from the Vagator beach and 3 Km from Vagator village. From Panjim, it is 21 Km and 45 Km from Dabolim airport. Since you are required to do a small trek up the hill, carry suitable footwear with you and a water bottle. Hawkers do sell water bottles up at the chapora fort sometimes but quote hefty prices. 8. Anjuna Beach: For the party animals who love to chill and unwind by the sea without missing out on the party scene, this beach is for you. Also, you can enjoy the sunsets from the sunset point here, a small hillock, while sitting at some cosy cafe or shack. Several popular party places are near-by from Anjuna and there is also the famous flea market that happens near the beach every wednesday. 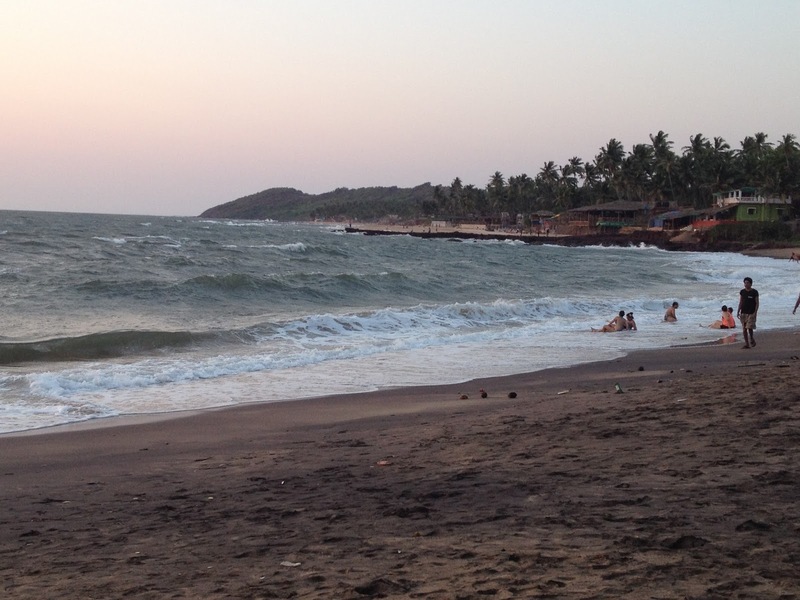 Anjuna beach is around 21.5 KM from Panjim and 45 Km from Dabolim airport. Most of the shacks are closed during the monsoon and there are no watersports too in this season but a couple of shacks like cafe lilliput and curlies remain open. 9. Palolem Beach: A beautiful serene beach far down in South Goa, this one will not disappoint you with its shacks, great food and most importantly, the picture perfect beach lined with palm tress and colorful little beach cottages; a great place for a swim too since it is comparatively less crowded and cleaner than some of the other popular beaches. You can also opt for boat rides to the nearby monkey island or just sun bathe on the beautiful beach. 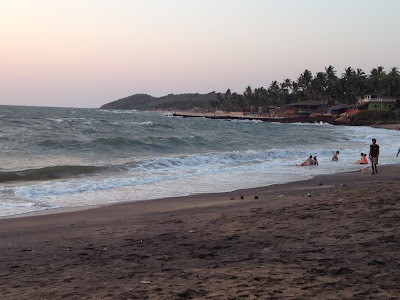 Palolem is 70 Km from Panjim and 61 Km from the airport, towards the southern part of Goa. During monsoons, some of the smaller shacks and beach huts are closed but a few of the bigger, popular ones remain open. 10. 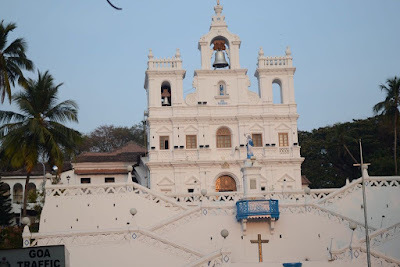 Our Lady of Immaculate Conception Church : If you are in Panjim, there is no way you can miss this stunning church that sits overlooking the busy square of the capital city. A chapel built in the 1500s on this site was later rebuilt into the present day 'Our Lady of Immaculate Conception Church'. Often referred to as the 'Crown of Goa', this church is always a favorite with the tourists. The crisscrossing stairway and the huge bell at the top are the distinctive features of this church. It is open everyday for visitors from 9.00 am to 12.30 pm and 3.30 pm to 7.30 pm. Being the city square, one can find restaurants and eateries of all kinds here. Also, there are a lot of shops selling a host of things from garments to souvenirs and the 18th June road - a haven for shopaholics is in walkable distance from this church. 11. Fontainhas: This old latin quarters of Panjim is a beautiful remnant of the Portuguese era, and a leisurely stroll through its streets is sure to take you back in time. And if you are done walking down the alleyways, admiring the colorful, picturesque houses, stop by some of the old quaint little cafes and art galleries and indulge in a variety of delicious goan desserts and baked products. The St Sebastian Chapel is another antique spot to check out at Fontainhas. For those interested in knowing more, go for the guided tours conducted by the Goa tourism department regularly. Preferably take a two-wheeler here to help you navigate through the narrow lanes and for ease of parking. 12. Dudhsagar falls: These beautiful waterfalls in the western ghats have been made famous by Indian films and every year, tourists throng to this beautiful spot to see the falls drop down majestically. Sometimes, you might even catch a train or two passing through the railway tracks above! Right from the jeep ride through the jungle to the small tek to reach the base of the falls, it is bound to create lasting memories for everyone! Dudhsagar is 74 Km from Panjim, 43 Km from Ponda and 74 Km from Dabolim airport. The jeeps rides that ply the tourists to the falls stop by 6:30 pm. If you wish to stay nearby, then there is the Dudhsagar spa resort, around 16 Km from the falls. 13. Tambdi Surla: Hidden away in the jungles of the western ghats is this ancient, unique temple, dedicated to Lord Shiva. This 12th century temple built during the Kadamba period is said to be the oldest temple in Goa. Located within the Bhagwan Mahavir Wildlife Sanctuary, the drive to the temple is as charming as the temple itself. So if you are in Goa, spare some time to visit this gem. The temple is about 68 Km from Panjim and 37 Km from Ponda. Though the temple can be visited in any season, monsoons are the best! It would be advisable to opt for a cab to visit this place instead of a two wheeler. For the adventurous souls, regular treks to Tambdi Surla are operated. P.S. You will not get any food in the immediate vicinity of this place hence it is highly advisable to carry your own food. Also, there are a lot of monkeys around the parking area, so it makes sense to stay alert with your belongings! From the numerous places in Goa, presented in the above list are our personal favorites. It was tough doing the filtering of course! Do you know some more great spots to visit in Goa worthy of this list? Or do you have any queries which were not answered in this post? Please go ahead and share them below. Artjuna Garden Cafe: Healthy and Delish!